There were a few things to report with the best birds being 2 juvenile Glaucous Gulls in Nouster Bay on 29th. Also in Nouster up to 41 Dunlins, 49 Ringed Plovers and 85 Sanderlings were present throughout, with a Common Scoter offshore there, also on 29th. Wildfowl on Bewan Loch on 27th included 3 Goldeneyes and 18 Pintails, while two days later there were 17 Tufted Ducks and 8 Shovelers among commoner species on the Lochs at the south end. The same day 7 Red-throated Divers and 4 Great Northern Divers were offshore, and 103 Purple Sandpipers were at Bridesness. The majority of the Thrushes had moved on but 34 Twite in the Observatory Crop included many new individuals (many of which were trapped and ringed). Still on 29th, 7 Snow Buntings were on the beach at Hooking and 2 were seen the previous day at Bridesness during the sheep round-up. The sun shone all day and there was another decent arrival of birds considering how late it is in the year and the now limited coverage. Thrushes were again the most evident with 68 Blackbirds a substantial increase on recent days, and in fact the highest count of the month so far! 30 Fieldfares, 28 Redwings and 3 Song Thrushes were also present. 5 Waxwings also arrived, with 4 of them along with 2 new Blackcaps and another new Chiffchaff among the 30 birds trapped and ringed at Holland House in the morning-a decent total given December is just around the corner. 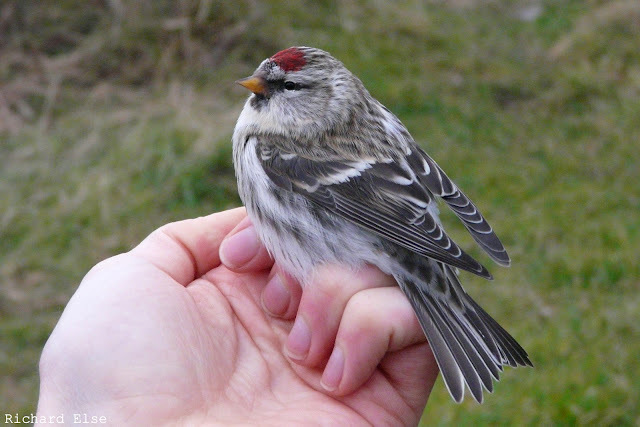 Also recorded today were 6 Robins, 10 Snow Buntings, the first Meadow Pipit for weeks and a Common Redpoll had latched onto the 37 strong flock of Twite. There were now 2 Kestrels patrolling the north end, with one of them seen to kill and eat an unfortunate Blackbird, plus the usual 2 Hen Harriers and a Merlin. The 7 Whooper Swans were still on Bewan, along with 17 Pintails, and 4 Grey Herons were together at Garso. The 21st saw a slight increase in wildfowl numbers with 21 Pintails and 14 Tufted Ducks the two species with their respective highest counts of the month so far. Also present were 7 Whooper Swans, a single Woodcock and 33 Snow Buntings. The 22nd-24th of the month were largely forgettable as horrendous weather set in for the period. The weather changed on 25th, with a light easterly and rain bringing a tiny flurry of late migrants to the south end of the Island. 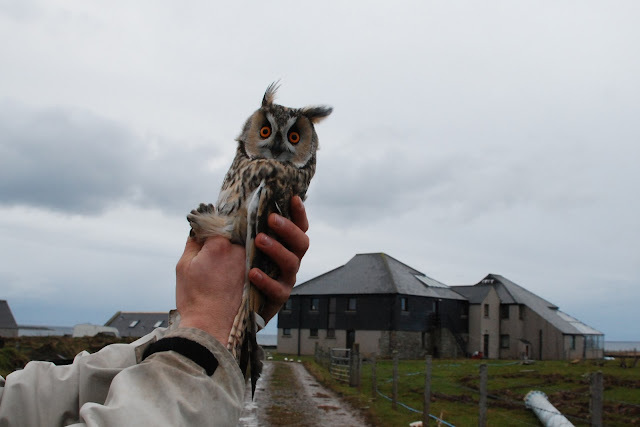 The highlights were 2 Waxwings south over the Observatory and a Long-Eared Owl caught in one of the Heligoland Traps. There was also a small arrival of thrushes with 22 Fieldfares, 7 Redwings and 19 Blackbirds counted. A Kestrel sheltering in the Pier store was presumed to be last weeks bird, but a Chiffchaff at Lurand was definitely new. A late migrant Kestrel arrived on the 16th, when the only other noteworthy sightings were 13 Fieldfares and a couple of Robins. There were 2 Redwings the following day and a Waxwing was outside the observatory, but there was nothing to report from a miserable day on the 18th. A couple of Woodcocks were found on the 19th, and 3 were seen on the 20th when other highlights were the Kestrel from earlier in the week and a Fieldfare. 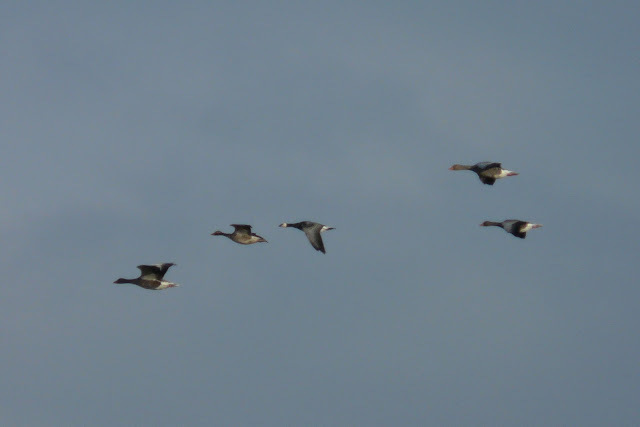 The Barnacle Goose was back among the Greylags, along with a Pink-footed Goose, on the latter date and 2 of the long-staying Chaffinches were still at Holland House. 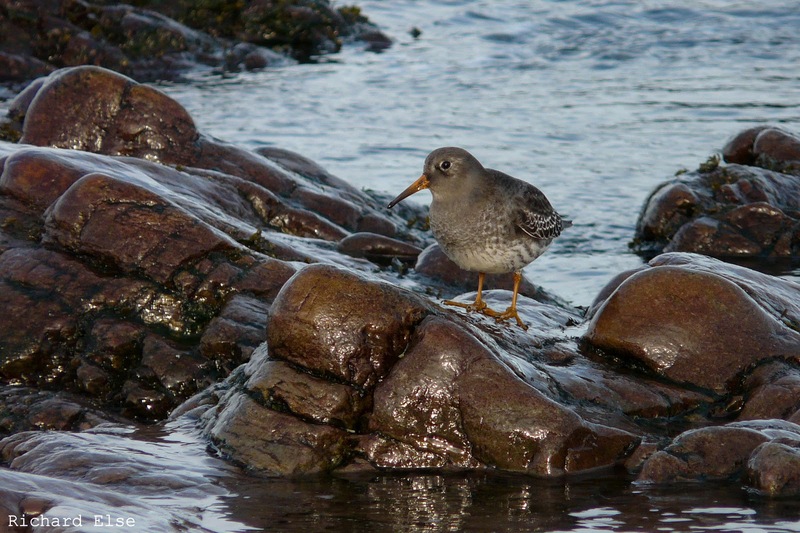 Up to 75 Purple Sandpipers have been counted in the last few days. The 13th was a reasonable day for raptors once the morning downpours had passed through, with a late migrant Sparrowhawk and 1 each of Peregrine, Hen Harrier and Merlin on the island. The best of the other sightings were 4 Waxwings, a Blackcap and the long-staying Chiffchaff. A single Waxwing remained on the 14th, while 2 Whooper Swans arrived and 18 Fieldfares were counted. The Whooper Swans were still present on the 15th, but there was little new to report apart from 5 Black-headed Gulls. Always a highlight during the winter months, small groups of Long-tailed Ducks are usually present in the sheltered bays. Most of the thrushes had moved on by the morning of the 11th, leaving just 28 Fieldfares on the island. A Dunnock and a Peregrine were new migrants and a Goldfinch and a Waxwing were seen again. A Common Scoter was notable and a couple of rather late Great Skuas were seen offshore. 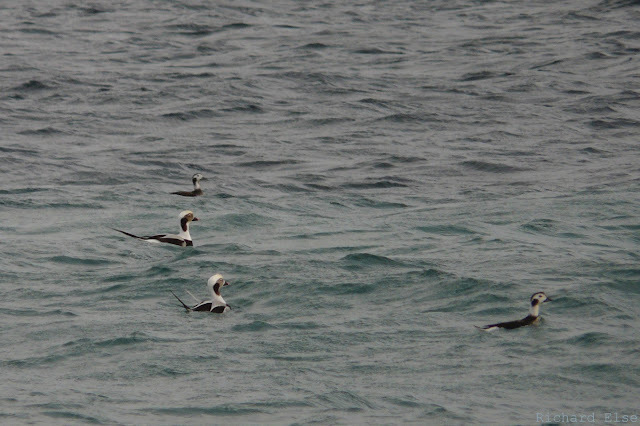 A seawatch on the 12th produced 2 more Great Skuas, as well as a Pomarine Skua, 3 Sooty Shearwaters and a Little Auk. 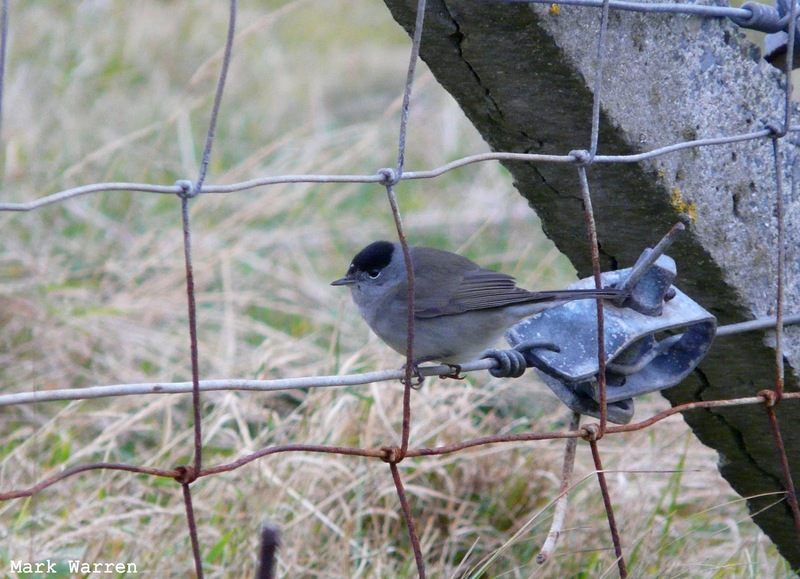 On land, new birds included 2 Blackcaps, 2 more Chaffinches and a Waxwing. The Long-eared Owl from a week earlier was retrapped at Holland House; other lingering birds included a Goldfinch and the long-staying Wheatear. A juvenile Glaucous Gull was the highlight of the 8th, when the only other sightings of note were a Peregrine and a late Wheatear still lingering at the lighthouse. A Waxwing arrived on the 9th along with a Goldfinch, 6 Whooper Swans and an influx of 64 Fieldfares. The Fieldfares increased to at least 206 on the 11th and brought 7 Redwings with them, while 2 Goldfinches and 3 Waxwings were also seen. Birds lingering throughout this period included a Chiffchaff and a Grey Plover. Amid a very end-of-season atmosphere, minds began to turn increasingly towards submitting rarity descriptions and writing reports rather than stepping out into the westerly wind and hail in search of whatever rare birds might turn up so late in the year and in such conditions. Nevertheless, there were at least one or two birds to report. A Long-eared Owl was trapped and ringed at Holland House on the 5th, while a Peregrine arrived, the Black Redstart was still there and 13 Waxwings were seen. The 6th had nothing to offer besides a single Waxwing, and even that had gone by the 7th. The Long-eared Owl and 2 Chaffinches were still in the garden and the Greylag Geese were still accompanied by a Pink-footed Goose and a Barnacle Goose. A quiet but very pleasant calm day had few new migrants to report. A Black Redstart at Holland House was the highlight, while a minimum of 11 Waxwings were around and a Whooper Swan arrived. There was a new Robin and a couple of new Song Thrushes, and lingering species included 3 Redpolls, a Blackcap and a Chiffchaff. There was not a lot of change to report, with continuing Waxwing passage the main event of the day: a count of at least 20 birds was our contribution to the spectacular totals being reported from the Northern Isles. Birds left over from earlier days included a Sparrowhawk, a Blackcap, a Chiffchaff and 2 Mealy Redpolls; fresh migrants included 4 Lapland Buntings, 3 unidentified Redpolls and a passing Little Auk. Things brightened after a miserable wet morning and a few birds were found to have come in with the rain. The day's total of at least 26 Waxwings was a new record count for the observatory, most of them continuing south without stopping for long. A Blackcap, 2 Chiffchaffs, 2 Chaffinches, 3 Bramblings, a Siskin and 30 Fieldfares were mostly new migrants and both Mealy Redpolls were still at Holland House. A Sparrowhawk, 4 Hen Harriers, 2 Merlins and a Woodcock were also seen. 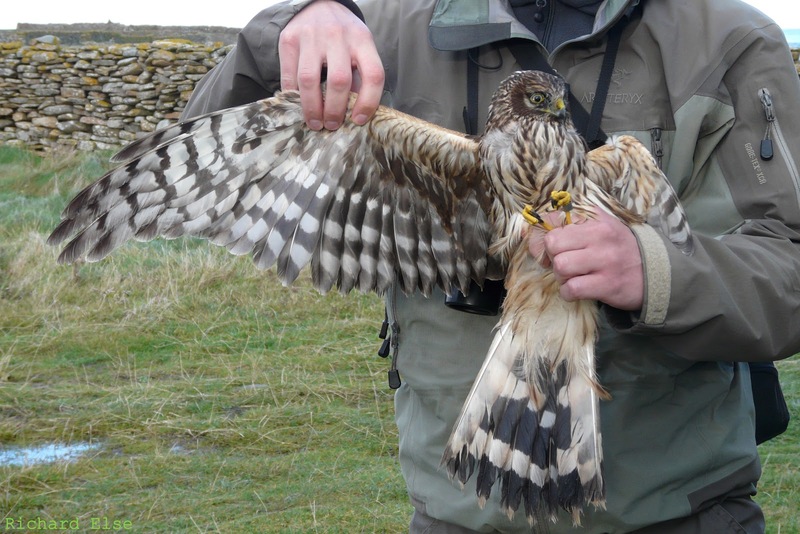 An unexpected addition to the ringing data sheets was a young Hen Harrier trapped at Westness and found to be already wearing a British ring. The bird was in quite a weak condition - weak enough to be caught by hand, anyway - but had a full crop of food and was able to fly on release. A very calm beginning to the new month brought some pleasant enough birding but still few notable migrants. At least 4 Waxwings were still around, 2 of which were trapped and ringed in the morning, and the previous day's Mealy Redpoll was joined by another Mealy Redpoll and 2 North-Western Redpolls. Other small migrants included a Lapland Bunting, a Brambling and a flock of 36 Snow Buntings arriving over the sea from the north. A Little Auk was the highlight of a seawatch, while a Common Scoter was swimming offshore and a count of at least 249 Eiders indicated a build-up of the species. Purple Sandpipers, also increasing in number, reached 140 birds, and further sightings included 3 Merlins, 2 Peregrines and 2 Hen Harriers. October went out quietly, fading away without any noteworthy species or falls of migrants as a parting gift. Half a dozen Waxwings were seen (and were probably a different 6 birds to the previous day's batch) and a Redpoll was new. A Chiffchaff, a Chaffinch and 3 Woodcocks were the best of the lingering birds.